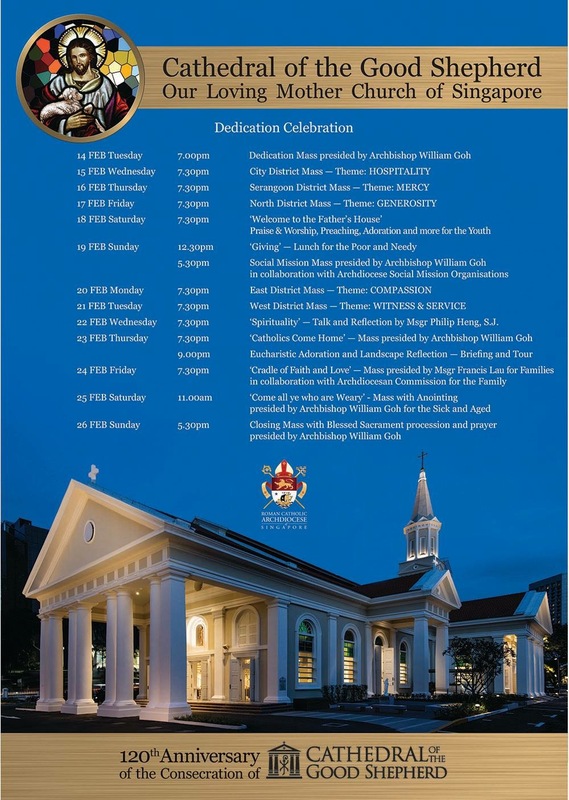 On 14 February 2017, the Church in Singapore is going to celebrate a great occasion of the Dedication of the Cathedral of the Good Shepherd, which is the principal and mother of all the parishes and churches in Singapore. 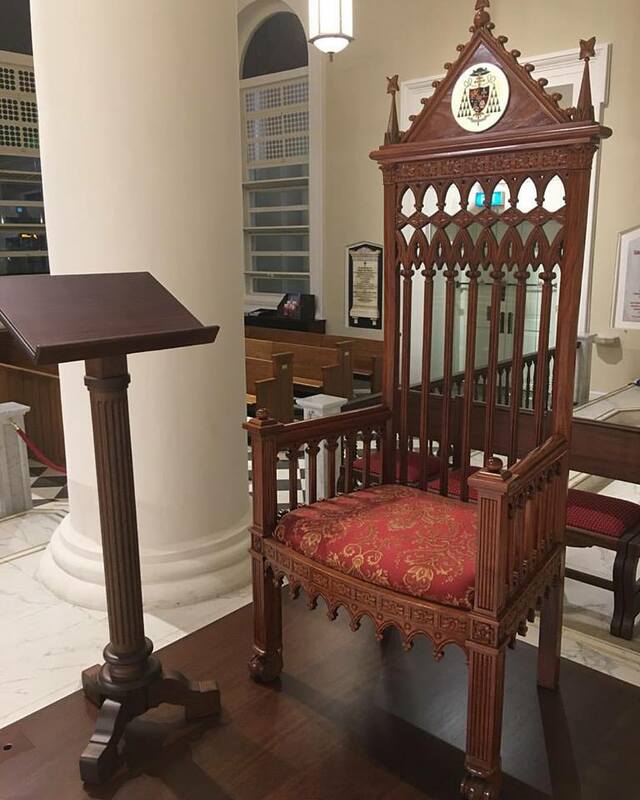 As the Cathedral of the Archdiocese of Singapore, it is the place where the Cathedra or the seat of the Archbishop of Singapore is located at. 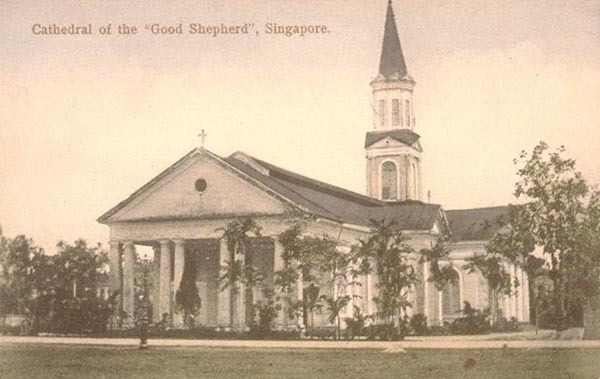 The Cathedral of the Good Shepherd was established as one of the first church buildings in Singapore, in the earliest days of its history as a British colony after it was discovered by Sir Thomas Stamford Raffles in the year 1819. The Cathedral had its origins in a simple and small chapel built from wooden and attap structure constructed between the year 1832 and 1833. 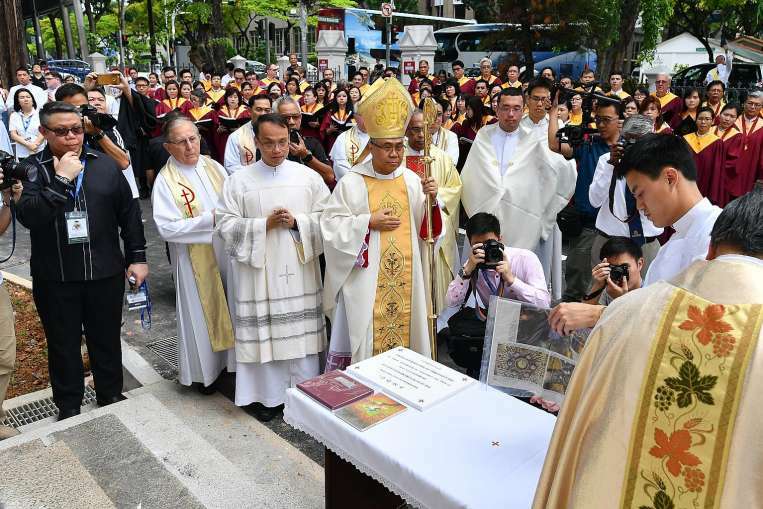 However, the rapid growth of the Church in Singapore, growing number of the faithful and pressing need for a more appropriate place for divine worship resulted in the efforts to establish a permanent place of worship for the faithful in Singapore. Upon generous donations from various individuals including that of the Queen of France and the Archbishop of Manila, the permanent church building that would become the Cathedral of the Good Shepherd became a reality. 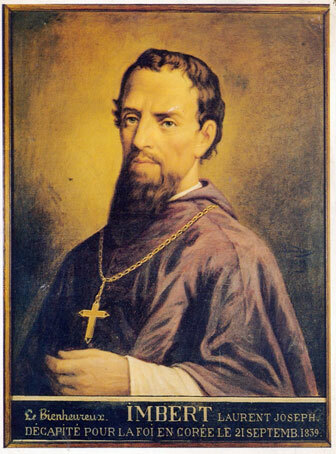 The foundation stone was placed in the site of the future Cathedral in the year 1843 and the completed church was opened and blessed on 18 June 1847, on the Feast of Corpus Christi by Father Jean-Marie Beurel, one of the pioneer priests and evangelisers in Singapore. The Cathedral of the Good Shepherd was named as such upon the inspiration from the holy martyr St. Laurent Imbert, one of the first Catholic priests to visit Singapore, who went on to be the first Vicar Apostolic to Korea, and was martyred for his faith there during the violent persecution against the Church and the faithful. It was told that he gave himself up to the authorities in order to safeguard the other faithful under his care, saying that “in times of great need, the Good Shepherd lays down his life for his sheep.” in the imitation of the Lord, our Good Shepherd. As the Diocese of Malacca (established in 1558 in Malacca, now in Malaysia) was reestablished in the year 1888 after it has been temporarily suppressed in 1839 (and later revived as the Vicariate Apostolic of Western Siam in 1841), the church that was to become the Cathedral of the Good Shepherd was elevated to the status of a cathedral, and Bishop Edouard Gasnier became its first bishop. He was interred in the Cathedral’s crossing (between nave and transepts) upon his death in 1896. 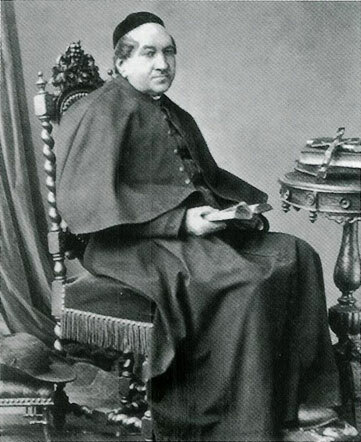 The Cathedral was dedicated by Bishop Gasnier’s successor, Bishop Rene-Michel-Marie Fee, who dedicated and consecrated the Cathedral to our Lord Jesus the Good Shepherd, on 14 February of the year 1897, 120 years ago to the current date. Ever since, the Cathedral had become the hub for the growth of the Church and the Christian faith both in Singapore and throughout the region for the next 120 years. 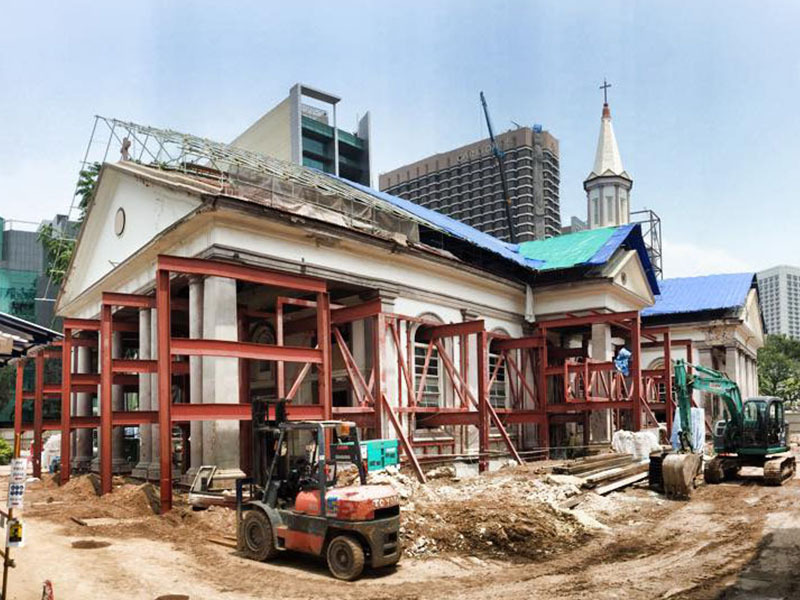 Ever since, the Cathedral had weathered through good and difficult times, including the turbulent years of the Japanese Occupation of Singapore, when it was functioning as an emergency hospital, but it weathered through them. Nevertheless, time and the rapid construction around it and underneath the ground due to the building of the Mass Rapid Transit train line caused the foundation of the Cathedral to be affected, and serious cracks started to appear on the structure. Therefore, serious efforts for a major renovation was carried out, and after many years of preparation, the Cathedral of the Good Shepherd finally was closed on 28 October 2013, for a thorough and extensive renovation and modification. 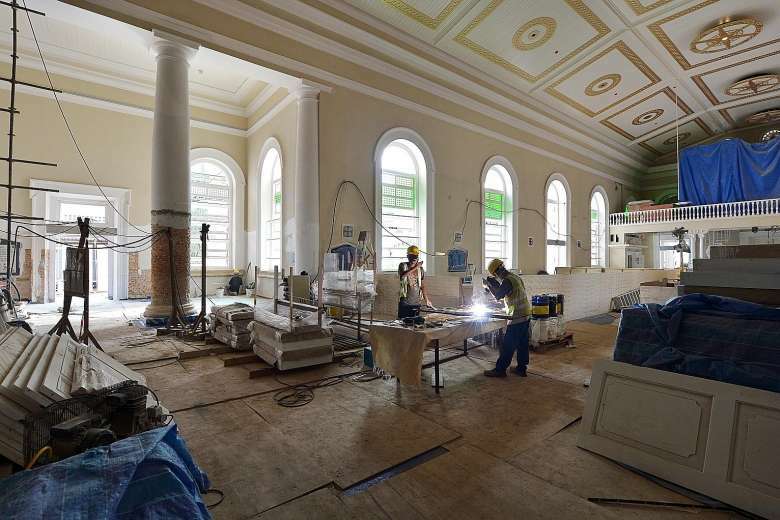 Throughout this major project, various discoveries were made on the historic nature of this Cathedral, including the discovery of the original foundation stone placed in site in the year 1843. The original layout and architecture of the Cathedral were also restored. 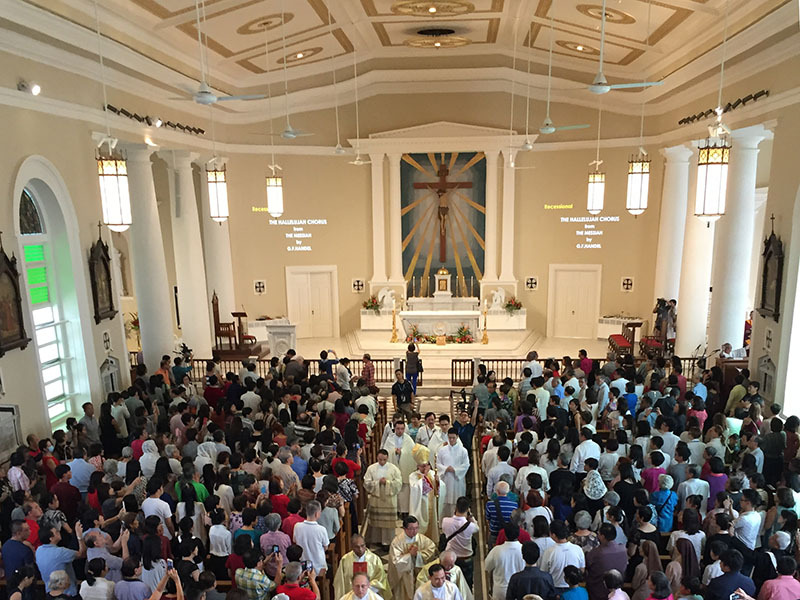 Finally the Cathedral of the Good Shepherd was reopened on 20 November 2016, on the Solemnity of Jesus Christ the King, by His Excellency Archbishop William Goh of Singapore during the Opening Mass, where he solemnly reopened the Cathedral for the purpose of divine worship. And now, on the 14th day of February of the Year of our Lord 2017, the Cathedral of the Good Shepherd is going to be dedicated to the Lord before all the faithful people of God. 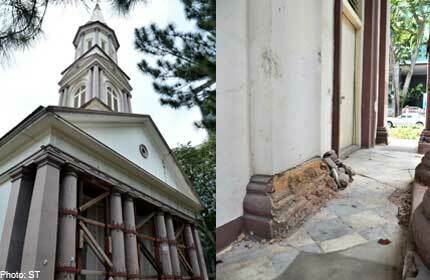 Pray for the Cathedral of the Good Shepherd, pray for the Church of God in Singapore! This entry was posted in Uncategorized and tagged 14 February 1897, 14 February 2017, Cathedral, Cathedral Dedication, Cathedral of the Good Shepherd, Catholic Church, Dedication Mass, Dedication of a church, Dedication of the Cathedral of the Good Shepherd, SGCatholic, Singapore. Bookmark the permalink.